Once you signup for TaskClone you will immediately be taken to Step 1 to authorize your source app. Note: You can change the duration of the authorization before you authorize and you can also revoke the authorization at any time from your TaskClone Dashboard. Once connected, you'll be prompted to connect your Destination app. Click here for help connecting your Destination app. 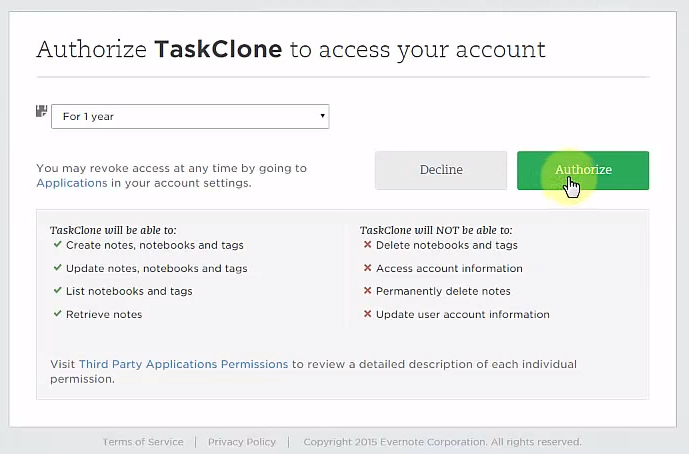 See How to use TaskClone with Evernote Business.